Throughout the 2018 season, the St. 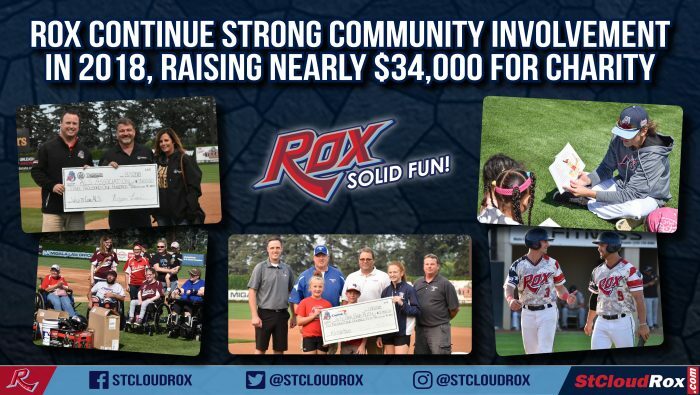 Cloud Rox once again teamed up with fans and corporate partners by focusing on giving back to Central Minnesota organizations by raising nearly $34,000 for area non-profit organizations. Since the Rox inaugural season in 2012, over $159,000 has been raised through a variety of events including silent auctions, ticket fundraisers and in-game promotions which have helped support nearly 200 Central Minnesota organizations in need. The Rox continued with a pair of unique in-game promotions that helped raise funds for two non-profit organizations. St. 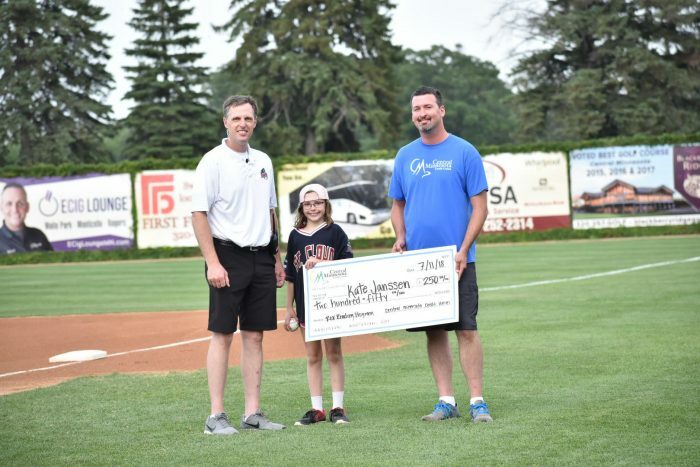 Cloud partnered with Capital One to raise nearly $3,000 for Waite Park Babe Ruth Youth Baseball and Softball through the K’s for Kids promotion, where $10 was donated for every strikeout a Rox pitcher recorded during home games. 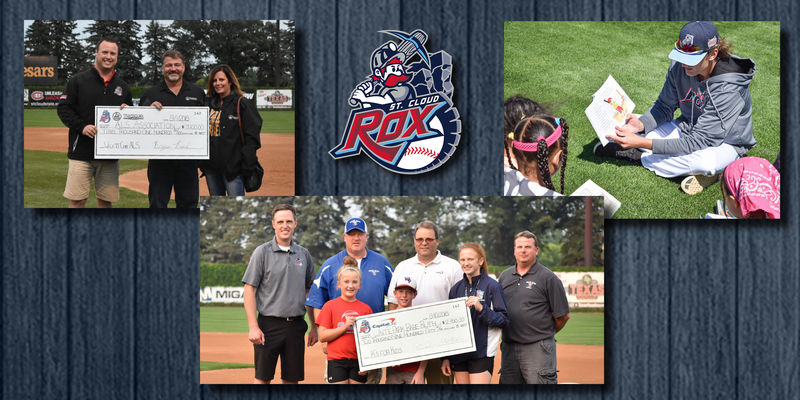 The Rox also partnered with Tischler Wood Products to raise $3,100 with proceeds benefiting the ALS Association through the Walk for a Cure promotion, where $25 was donated for every walk a Rox player recorded during home games. 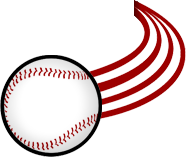 The Rox teamed up with the Northwoods League Foundation “Share the Glove” program to award the Miracle League of Central Minnesota with the Share the Glove youth equipment grant, which provided baseball equipment totaling a retail value of $2,500 including catcher’s gear, gloves, helmets, bats and baseballs. In addition to raising funds for local charities, Rox staff, coaches and players spent time visiting many local senior living communities, libraries and summer camps getting to know fans of all ages in the St. Cloud area. Making over 60 community appearances during the year, St. Cloud’s staff, coaches and players totaled over 1,000 combined volunteer hours. The Rox shared experiences with fans, read books to children and even offered baseball instruction at several baseball and softball clinics. The St. Cloud Rox are proud to partner with Central Minnesota Credit Union for their Rox Reading Program. This past spring the Rox and Central Minnesota Credit Union helped motivate over 11,000 kids in over 480 elementary classrooms in Central Minnesota to read outside the classroom! Kids in each classroom participate in a four week reading program. Each week a lucky winner who completed their reading goals for the week is selected in each classroom to receive a prize and then every child who completed the four week reading program receives two Rox tickets and a certificate of completion courtesy of the St. Cloud Rox and Central Minnesota Credit Union. One student who completes the reading program receives $250 placed in a Central Minnesota Credit Union savings account. The St. Cloud Rox are always looking for volunteer organizations to help out at home games and one group has always been willing to go above and beyond with the support they offer. The Rox have been working closely with the RSVP group who volunteers at a majority of the Rox games each season. They have done an outstanding job and make the experience for all fans great. 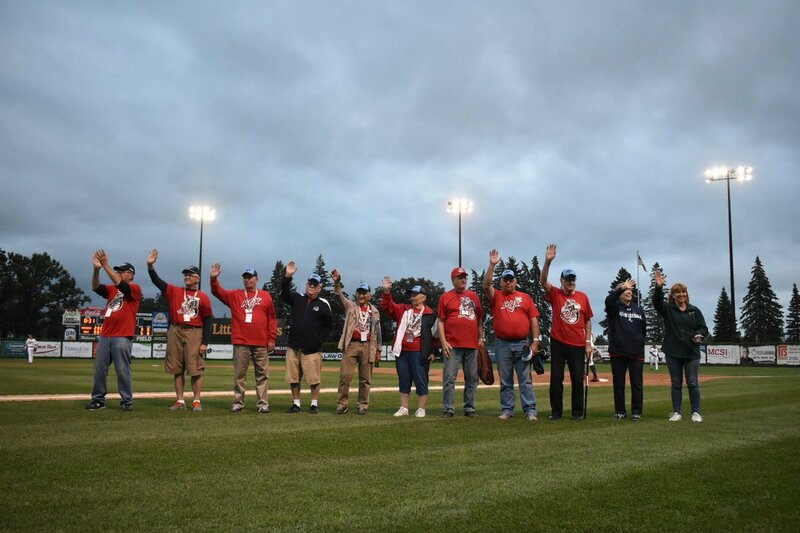 Pictured is the RSVP group being recognized for their service to the Rox during one of the home games last season.